When I was younger, I thought people said “bless you” after someone sneezes because your heart momentarily stops with each “achoo.” I don’t know who told me that tale, but it stuck with me. And, it turns out it was wrong. Now, many centuries later, people across the world wish people well after they sneeze by saying “to your health” and “bless you” – among other responses. And, they do so in all different languages. In German, people say “gesundheit” which means “health.” As a person of German descent, I recall “gesundheit” being the common “blessing” when someone sneezed in my home – and it’s what I use with own family today. According to Flor of Little Nomadas, in Spanish it’s also common for people to wish you good health when you sneeze. That’s why the Venezuelan-American mom of three says Spanish-speaking people say “Salud” when someone sneezes. Chontelle of Bilingual Kid Spot shared that in Italian people say “salute” which means “to your health.” But, it isn’t very formal. So, if you really want to be polite, you wouldn't say anything at all when someone sneezes – and may even wait for them to say “sorry” or “excuse me” instead. Ute of Expat Since Birth said the same formal approach is followed by German, Dutch and Swissgerman speakers. Olga of The European Mama shared that in Polish people wish you “Na zdrowie” which means “to your health.” While in Russian, people say “Будь Здоров” which means “be healthy” – as shared by Varya of Creative World of Varya. And, over in Latvia, people say “uz veselibu” or “to your health” according to Ilze of Let the Journey Begin. According to Chontelle of Bilingual Kid Spot, people in Australia say “bless you” – similar to what you most commonly hear in other English-speaking countries like the U.S. and the UK. Charu of Ketchup Moms shared that people in India now say “bless you.” But, growing up, her grandmother would wish her, “Jai Mata Di” which means “God is great” in Hindi. But, of course, there are other responses, too. In French, it pays to count someone’s sneezes. 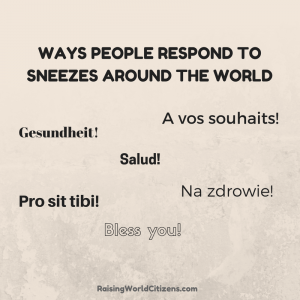 As shared by Annabelle of The Piri-Piri Lexicon and Virginie of Travel with My Kids, people say “a tes/vos souhaits” or “to your wishes” when someone sneezes. But, sometimes people also say “a tes/vos amours” or “to your loves” after the second sneeze and then “qu’elles durent toujours” or “that they last forever” after the third sneeze. Of course, here in the U.S., it's easy to hear a mixture of responses - which is a reflection of the many languages spoken here. For me, I enjoy hearing people saying "bless you" or "gesundheit" to anyone who sneezes – even total strangers on the street, on the subway, in stores or in restaurants. While we may not always say “hello” or even smile at those same people, we’ll often stop and share a polite response when someone – anyone – sneezes. Which, to me, is the greatest blessing of it all. What do you say when someone sneezes? And, what does it mean? Do you always feel the need to respond when you hear "achoo?" Share your stories in the comments below.